You dig up your wardrobe to take out the best of the best dress. You go to the parlor and get everything done that is needed to enhance your looks. And when you are all ready, you check in the mirror, again and again, to make sure you are looking your best. 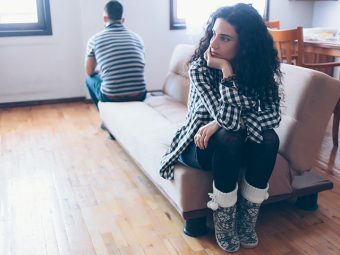 That’s what a date does to you, whether it is your first date or the nth one, and whether you are married or unmarried. A date rakes up the feelings that get buried somewhere underneath your daily responsibilities in the routine lives. Not just going on date but choosing what to do during the date is also important to make it a memorable one. 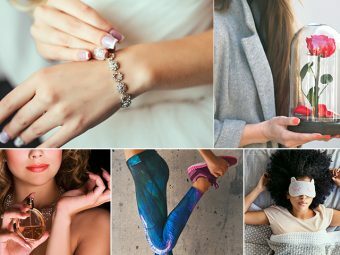 If you are looking for some unique date ideas, then read on as MomJunction lists out some really useful date ideas for couples. 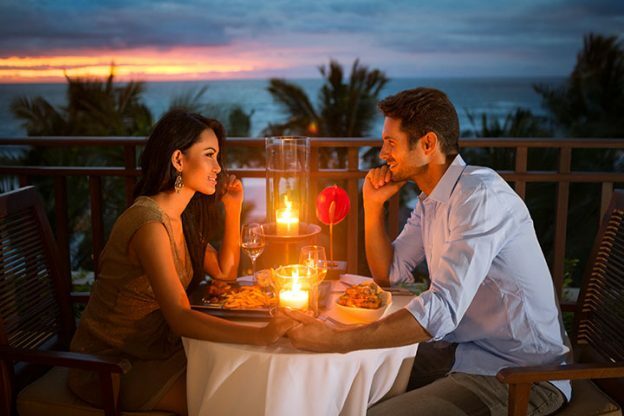 You never need a reason or an occasion to go on a romantic date with your loved one. While each couple has its own meaning of romance, here are a few romantic date ideas you may try. Dine at a fancy restaurant: Take your partner out for dinner to a fancy restaurant or the most happening place in town. Make sure the restaurant you are going has something unique such as live music, provision to make special requests and/ or some rare delicacies. Plan a picnic: This may seem old school, but never goes out of style. Drive down to a place close to nature, spread a blanket on the grass and lie down with your partner to share childhood stories and chat for hours together. Go on a vineyard tour: Choose this activity on your anniversary or your spouse’s birthday. Take them on a tour to the local vineyard, taste some fresh wine and click a lot of cozy pictures. Also, if there are any free wine tasting sessions happening, do not miss them. Have a photoshoot: Photoshoots are a favorite date idea now. Be it to celebrate a special event or just to have fun, plan a couple photoshoot for you and your partner. You can try funny and cheesy poses and at the same time create memories to look back. Go on a long drive: Long drive is a classic idea for romantic dates. Pack some food, drive wherever the road takes you, and watch the sunrise or the sunset together, hand in hand. In between the drive, take breaks to have some romantic time together. Role-playing: Turn your imagination into reality with this idea. You can either surprise your partner with an invitation or pick an idea together. Once the roles are decided, get into the character and get ready for an unforgettable romantic date experience. Have a massage done: Book an appointment at a spa for you and your partner, and get a relaxing body massage done. If you can book it in a resort far away from the noisy city then nothing like it. Try a couple dance form: Certain dance forms, such as Rumba, Waltz, Tango, and Bolero, seem to be made for couples in love. These dance forms are sure to ignite the passion between you. Plan a staycation: Book a room on the top floor of a luxury hotel and spend a couple of days together. Go for a swim, relax in the spa, order food to your room and have some memorable private moments together. Go on a hike: If you both love adventure and don’t mind stretching your legs, then plan a romantic outdoor hike date. Pick a nice spot and hike it together, and after you reach the top, spend time admiring the magnificent view. Do gardening: Activities like gardening give couples lots of time to spend together. Spend a weekend mending the lawn or planting trees. To make it more memorable, plant a sapling and write the date on it. As it grows, it will stand as proof for your togetherness. Join laughter yoga: This is a good idea to take your connection with your partner to a completely different level. Laughter yoga begins with asking partners to look into each other’s eyes and fake laughing, which soon will turn into spontaneous laughter. You can also do yoga together for bonding, relaxing and being outright romantic. A date night gives the couple a break from their routine family life. So, amidst all the responsibilities, keep aside one night a week for yourselves. And if you are looking for ideas to make your date memorable, then here are a few to start with. Watch your wedding video: Do something special and personal for your next date. Instead of choosing a TV show, watch your wedding video and reminisce all those moments together. Give your spouse a sneak peek into your life: This is a spontaneous yet romantic idea for couples. Take your spouse to all the places you visited with your friends as a child by sneaking out of your house in the night. Or narrate your childhood stories and secrets. Recreate your wedding night: This is a unique anniversary date idea. You can replicate your wedding day and for this, you need not go overboard. Just get into your wedding outfits, order the same flavored cake and a bottle of champagne to raise a toast to the successful journey together. Drive-in movie: This is an effortless romantic idea. All you need to do is book tickets for a romantic movie. Drive in to the place, cuddle with your partner and get carried away with the romantic feel. 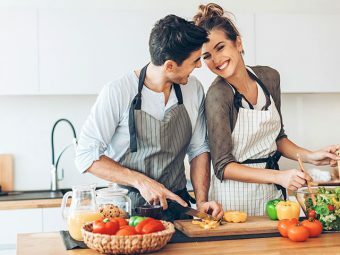 Cook together: Cooking is a great recreational activity for couples. Choose a dish, start with shopping at the local grocery shop and end with relishing the dish you prepared together. Go camping: This gives you plenty of alone time. Pick a safe spot for camping in the woods, set up a tent, and unwind. You can also set up an outdoor barbeque, and enjoy the self-made food in the wild. Go street shopping: Visit the local flea market or a night market, hop around the various stalls, spend time buying knick-knacks and eating street food. You wouldn’t even realize that you have been awake the whole night. Movie marathon: With this idea, both you and your partner can have a romantic date night in your PJs and in the comfort of your home. Sounds like heaven right? Yes! Choose your favorite TV show or a list of movies, cuddle up with your partner and watch all night. Watch a sport live: If both of you love sports, then book tickets to watch a game of cricket, football or basketball. Cheer your favorite team, shout your lungs out when they score and have a gala time together. Hop on and ride away: Yet another romantic date idea is to just hop on a bike and ride away during the night. Cruise around the empty streets and visit famous monuments, which are otherwise filled with tourists during the day time. Riding on the empty roads with your partner gives you a high. Deck up your room for a memorable night: Plan an exclusive date night for just the both of you. Send flirty messages beforehand. Lit the candles, put rose petals on the bed, have a bubble bath with essential oils, and go by the mood. Organize a candlelight dinner at home: Nothing is more romantic than cooking your partner’s favorite food. Take it up a notch by arranging a candlelight dinner at your home. “Couples that play together stay together.” Dates need not always be romantic or at night. You can laugh, play and have fun like children on your date. These fun-filled outings help in increasing the intimacy and building a long-lasting friendship between the partners. Visit an amusement park: This will wake up the child in you. Plan and spend a day in a water park or an amusement park. Go on rollercoaster rides, share cotton candy, and try various fun activities. Attend a live concert: Book tickets to a live concert and have fun along with your partner. Live concerts are filled with energy — you get to scream, sing and dance. Go bowling: This is an idea which works if you want to go just the two of you or in a group. Hit to the nearest bowling alley; you can team up against each other and or work as a team to score points. Exercise together: If you have been thinking of starting an exercise regime, then this is the time. Go for a run or a jog together or participate in a marathon. This will serve two purposes — it will give you guys some time together as well as keep you fit. Strike off items on your bucket list: These could be desires stashed in the corner of your heart. If you are saving up for an adventure, then wait no longer; put your plan into action on your next date. Plan a game night: Nothing is more relaxing and stress-busting than sitting in the comfort of your home, ordering pizza and playing childhood games like Scrabble, twister or chess with your partner. Visit a local shelter for animals: If you two are animal lovers, then head out to a local shelter and volunteer to help them. And if you are looking to adopt an animal, then this volunteering helps you know whether you are ready for that. Take a surprise trip: If you are sure your partner is ok with surprises, then plan a trip to a romantic destination and keep it a secret from your partner. Pack their bags or ask them to pack to visit your friends, and then take them to their favorite destination. People gazing: This is a fun activity when you and your partner are on the same page. All you need to do is visit a mall or a busy street, look for a comfortable spot, settle down with your partner, observe people around and make up some funny and ridiculous backstories. Plan a day at the beach: If you are lucky to live in a coastal area, there is no perfect spot than the beach to have a fun outing with your spouse. You can head out early and catch the sunrise or stay late to witness the sunset. You can also play in the water or just lie on the sand and talk about the things you both like. Relive your first date: It could be a coffee shop or your favorite pub or your college cafeteria, revisit the place where you first met or had your first kiss or proposed. To make things better, you can wear the same outfits, behave like strangers and meet just like how it happened the first time. Food cart hopping: Ditch the regular dinners, and go on a street food extravaganza, hopping from one cart to another savoring the uniqueness of the street food. Rent a boat: Paddling through the mountains, just the two of you getting lost in the lap of nature… sounds relaxing, right? If you are living near a lake, then rent a boat or a kayak, reach a destination and spend some time exploring the place. Attend a stand-up comedy show: If your favorite stand-up comedian is having a show, then book tickets and have good laughs together. You need not always burn a hole in your pocket to spend time with your partner. While you can save them for some special occasions, on most other occasions, you can have a good time without splurging. Here are a few inexpensive date ideas for couples. Bonfires: Try this romantic and intimate idea during winters. All you need is a fireplace, a warm blanket, and your partner with you. Cuddle all night long, have romantic conversations, have a drink together while listening to soft music and gazing at the starry sky. Pamper each other: Recreate a spa at home and pamper each other. Give a massage to each other and feel relaxed. Go on a farm visit: You can either volunteer to work in the farm or just run along playing hide and seek. If you can go for fruit picking, then nothing is more romantic than that. Bike rides: This idea doesn’t cost much, is healthy and fun at the same time. Rent bicycles and go on a leisurely lap around the park or on the streets. Bake together: It could be a cake or a batch of your favorite cookies, pick up a simple recipe and cook together. Declutter: Have you been thinking of clearing the basement or painting the fence? Fix a date and do it together. Mundane tasks also seem fun when you have company, agree? Try digital detox: Turn off your mobile phone, stop browsing the internet or social media and just relax in each other’s company. You may feel the urge to use your phone, but resist it and turn your attention towards your partner. Get a home project done: Be it building a tree house or a dog house, dates can also be used to complete a long pending project. This way, you can spend time with each other as well as get a job done. Order a takeaway and laze around: This would probably be the best date idea for a couple who have been working the whole week. Relax in your PJs all day, order your favorite food and spend the day in bed. Play a sport: Be it basketball or badminton, play your favorite game with utmost passion. Sweat out for half a day, then visit a local cafe and have brunch together. Plan your next vacation: You have decided to spend some time with your spouse. Then why not utilize this time to plan your next holiday? Planning together will make you feel that you are almost on that holiday. Video game competition: Do you both love video games? Then why not challenge each other? This way you can also experience the competitive spirit between you. Invite couples: You can invite a couple among your friends for lunch/ dinner or together plan an outing in the woods. Have a fondue night: Fondue nights have become the in-thing for couples. They are fun and intimate. Set up a fondue party at your home and enjoy it together. Choose simple ingredients such as cheese or chocolate; you can use a saucepan in the place of an expensive fondue pot. Watch a horror film together: If you want to stay at home as well as do something thrilling, then play a horror movie, grab the popcorn and watch together. Organize a yard sale: If you are looking to get rid of some unwanted stuff at home, then get together and organize a yard sale. This is another inexpensive way to spend time with each other. In fact, it will help you earn some money. Spend an afternoon in the park: You can walk hand-in-hand to the nearby park, stroll through the greenery, feed the ducks at the pond and have some quiet time together, away from the crowd. You can do innumerable things on a date. The best part is doing something impromptu. Just do what you feel like doing at that moment, steal a kiss, press your partner’s hands or simply look into each other’s eyes and forget the world around. The ultimate goal of a date is to strengthen the bond between you and reassure each other that you are in the best company possible. What is your idea of having a date? Let us know in the comments section below.